It’s common knowledge that South African Native Labour Corps men who served in France during World War 1 were kept separated behind barbed wire fences and were not allowed to fraternise with the local populations. The men had to be supervised and controlled by white South African men who had experience of managing black labour in South Africa. This scenario is often used to prove white South Africa’s racial tendencies. Among other regulations, smoking was prohibited on duty and in public places. Alcohol was forbidden – except when prescribed ‘for medicinal purposes’ – and no member of the Corps was allowed even to enter an establishment which sold it. All letters were read by administrators, while a stringent system of chaperoning existed … The barbed wire fences around the camps served to keep the women in as well as the men out. Yes, you read women, not black South African Native Labour Corps. Women, white, also denied the vote at the time were being treated in a similar way to black South African men. The quote comes from “The Forgotten Army of Women: The Overseas Service of Queen Mary’s Army Auxiliary Corps with the British Forces 1917-1921” by Diana Shaw in Facing Armageddon: The First World War Experienced edited by Hugh Cecil and Peter H Liddle. Isn’t it interesting how we shut off that which frightens us? We don’t want to engage with what we don’t know or fear. Writing this I was reminded of an incident a good few years back now when I was still in almost full-time education. The BNP in the UK were looking as though they were going to do quite well in the general election and I was horrified at how colleges and others refused to invite BNP representatives to their institutions to be questioned by the students. It was acceptable to have the Labour, Conservative, Liberal Democrat and Green candidate visit and be challenged but not the group most feared. Ostensibly this was to ‘protect the students’, but what it did was increase curiosity and, at least, verbal support for the party – everything education leaders were trying to avoid. Similarly, my initial intention as an historian was to study communism as, at school we’d been told this was what Apartheid was against. Communism was bad and our boys had to fight it. This made Nelson Mandela and others all terrorists. Other factors got in the way of my specialism, but I still hold a sideline interest in all things communist. Today, as in years past, we continue to put people into camps until we’re sure about them – the Boer women and children, refugees, asylum seekers. Cross-dressers and others suffering from physical and mental differences get put in asylums or care centres, those who don’t follow our rules are put in prison… and yet others seem to languish because we’re too afraid to let them out having discovered they weren’t a threat to begin with. Hiding people away and shutting them off from the mainstream doesn’t seem to me the best way of dealing with difference. Somehow we must find ways to engage – as the men working alongside the Women’s Auxilary Service and the SANLC found, we have more in common than not and together made working for a common goal more easily achievable. Every time I experience new cultures and meet others who travel in the same way, it reinforces the need to cross barriers and engage. Understanding the ‘other’ leads (more often than not) to respect and a greater sense of community. Transvaalitis – how do we overcome? You’d be forgiven thinking this was a new disease – medical disease that is. Trying to find some clear background to the term has proven quite a challenge – Yahoo doesn’t want to know it (really) and Google gives a few book references. As soon as you add ‘origin’ or ‘meaning’ to your search you get results such as ‘Transvaal. It is…’ – not very helpful for someone like me trying to find an author who has tried to engage with the term and not just repeat what everyone else has said before. I came across the term reading Richard Holmes’ chapter ‘The last hurrah: cavalry on the Western Front, August-September 1914’ in Facing Armageddon The First World War Experienced edited by Hugh Cecil and Peter Liddel (1996, 2003) p281 – this book had been recommended by Jennie Upton some time back and it’s taken me about three years to get to where I have: it’s not a book to take on the tube or in handluggage due to its length (900 pages) so has to wait for opportune moments to be read at home. Having said that, it’s a worthwhile read (most of it so far) as it opens up insights into aspects of the war few have considered before. For a non-Western Front student like myself, this is rather refreshing. There’s not a great amount on the African campaigns, but it’s definitely worth seeing how other small groups and minorities compare. It’s a great attempt at breaking the myths. Back to Transvaalitis. It’s best to quote from p281 after some context. Holmes is talking about infantry assaults on ‘others in a position which favoured defence’ looking back to what was learned from the Franco-Prussian war of 1870s. ‘From the 1880s till the outbreak of war infantry theorists grappled with this problem. Many concluded that the answer was to weld men together just as tightly as in the past, throwing them into battle shoulder to shoulder to the sound of drum and bugle. This would result in appaling losses in the short term – but it would at least produce a decision, not sterile butchery. And it would avoid what one caustic French officer described a ‘acute Transvaalitis‘ – paralysis by fire. Even the British army, which had, after all, studied the epidemology of Transvaalitis at some collective cost, concluded in Infantry Training 1914 that ‘The object of infantry in the attack is … to get to close quarters as quickly as possible.’ Once there, the commander on the spot was to judge when superiority of fire had been achieved and then order the assault. And now, believe it or not, I quote. 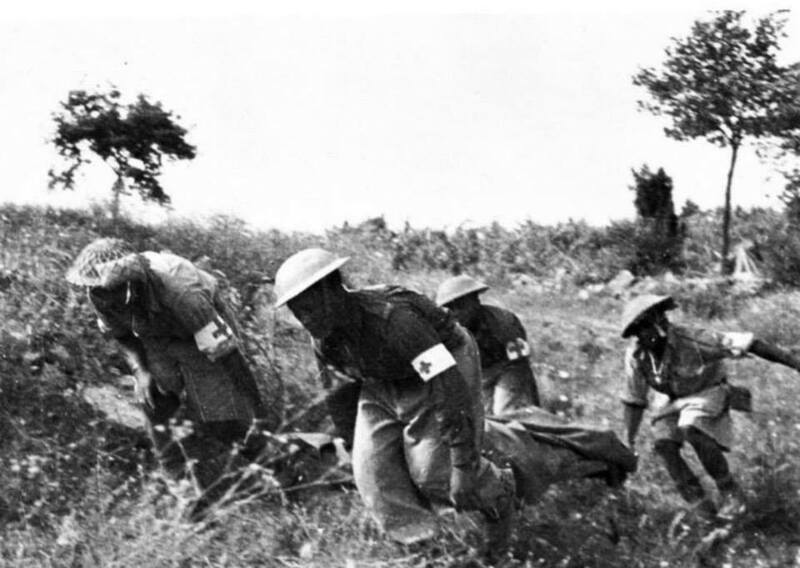 This looks to me no different in principle to the infantry tactics in vogue when the line was red rather than khaki. The reference given for Transvaalitis is ‘General Langlois, founder of the Revue militaire generale, quoted in Joseph C Arnold ‘French tactical Doctrine 1870-1914’, Military Affairs vol 42 no 2 (April 1978). I assume one will have to get into Langlois’ writings in French to see what and why he came up with the term as Holmes and a few other authors who have used the term don’t go much further than noting ‘paralysis’ or an ‘abnormal dread of losses on the battlefield‘. Theorists and practitioners were unsure whether firepower favoured attack or defence. The Polish banker, Jan Bloch, author of the perceptive Future War, declared that it simply ruled out frontal attack, and British experience in South Africa seemed to prove that Bloch was right: both British and French infantry regulations were modified to reflect the reality of the fire-swept battlefield. But it was not that simple. The weight of military opinion believed that wars were won by offensive action, and it followed that an army which allowed itself to be paralysed by firepower –‘acute transvaalitis‘ – could not expect to win. Moreover, as Colonel Charles Ardant du Picq had acutely observed even before the Franco-Prussian War, on the new battlefield `cohesion is no longer ensured by mutual observation’. What would happen if these loose, flexible formations met the enemy’s fire? Officers would be unable to lead effectively, and soldiers’ courage would not be buttressed by the close physical proximity of comrades. Men – short-term conscripts, most of them – would go to ground and not get up again; impulsion would be gone and stalemate would result. I assume (not a wise thing to do, but needs must) therefore that Tranvaalitis was a term derived from the British response to the Boer defence (a rather strong term some might think) of the Zuid Afrikanse Republiek (ZAR) or Paul Kruger’s Transvaal during the Anglo-Boer War on 1899-1902. Did this arise from Tommy’s reluctance to move forward unsure of where Boer snipers were hiding? The Boers had a reputation for being crack shots – whether this reputation was well-grounded in fact or not, the point is their reputation was enough to stop a larger force in its tracks. Overcoming the fear instilled by this reputation would have been challenging for any commander until there was a complete rethink and break in traditional approaches to the fight: the blockade and concentration camp system that was then introduced by Lords Roberts and Kitchener. Today, we still struggle to think outside the box and find innovative, non-violent solutions (where possible) to many problems. We all suffer from Trasvaalitis – paralysis of fire – in some way. And I couldn’t help but wonder if Langlois came up with the term after seeing this little fellow: the Transvaal fat-tailed scorpion aka parabuthus transvaalicus. It would definitely stop me in my tracks, and that’s without knowing about its firepower.